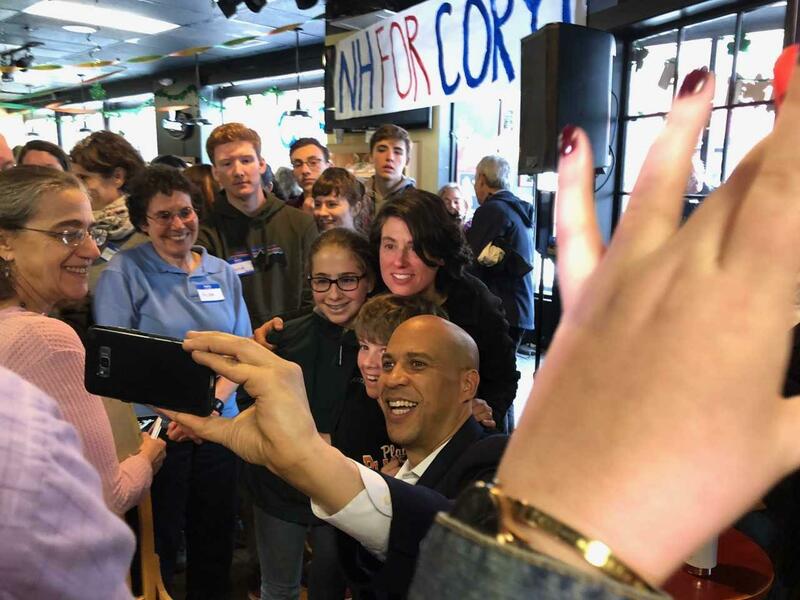 At a campaign stop in New Hampshire on Friday, U.S. Sen. Cory Booker, D-N.J., all but confirmed he would pick a woman as his vice president if he won the Democratic nomination for president. “No matter what — I’m looking you in the eye and saying this — there will be a woman on the ticket,” Booker told the crowd at the Salt Hill Pub in Lebanon. “I don’t know if it’s in the vice president’s position or the president’s position, but if I have my way, there will be a woman on the ticket,” he added. On his second campaign trip to New Hampshire, Booker reiterated his support for equal rights and said he hoped former Democratic nominee Hillary Clinton, who he said was the most qualified candidate to ever run for president, had beaten Donald Trump. “I wish there was a woman president right now. I worked very hard to make sure there was a woman president,” Booker said. Booker noted that women — including women of color — occupy senior positions in his Senate office, including chief of staff, head of legislation policy, and state director. That message resonated with Maria Goodwin, a 16-year-old Lebanon resident who will be old enough to vote for the first time in next year’s presidential election. She snapped a selfie with Booker after the event. “I told him how I appreciated how he stands for women’s rights in the government and across America, and how he supports equality,” Goodwin said. But others at the event were wary of Booker’s vow to put women in senior-level positions while there were several female Democrats running for the top job itself. “I’m not trying to be mean or anything. We don’t need a man in the White House to fight for our rights,” said Mary Jane Mulligan, a Democratic state Representative from the Lyme and Hanover area. About half of declared Democratic presidential candidates are women, including Booker’s Senate colleagues Elizabeth Warren, D-Mass. ; Kirsten Gillibrand, D-N.Y.; and Kamala Harris, D-Calif.; as well as Rep. Tulsi Gabbard, D-Hawaii.